Welcome aboard the Pineapple Express! It’s a fun, wild ride that’s sure to impress. Quick now, get on! We are all set to go. Whirling and twirling, how big can we grow? You! Yes, you there! Only one bag each please. Better hold tight or lose it to the breeze. Tuck in your tails and stay clear of the void. The eye of the storm can get real annoyed. Strong winds like us don’t just travel for fun. Turning and churning, there’s work to be done. Rivers and lakes call with hoarse dusty sighs. No bus, plane, or train can beat this commute. It’s here that you’ll smell like tropical fruit. Wait, say again? You are feeling upset? Oops, did I mention that you might get wet? Place pineapple and 1 tablespoon sugar in medium saucepan. Cook over medium heat, stirring occasionally, until fruit has softened and mixture becomes jammy, about 15 minutes. If pineapple looks too dry during cooking, add a teaspoon of water at a time. Remove from heat and stir in lemon juice. Adjust to taste with additional sugar and lemon juice. Chill until completely cold before using, about one hour. Using mixer fitted with whip attachment, whip heavy cream on high speed to soft peaks. 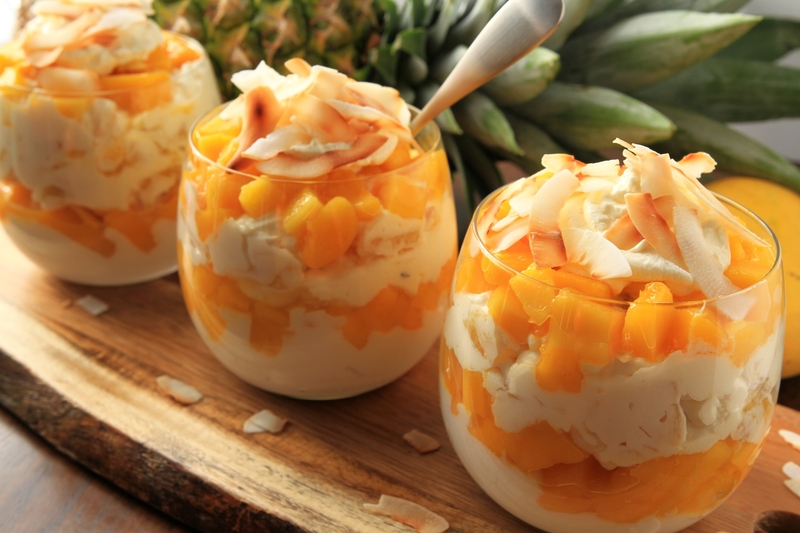 Fold in coconut yogurt, greek yogurt, pineapple compote and half of the shredded coconut. 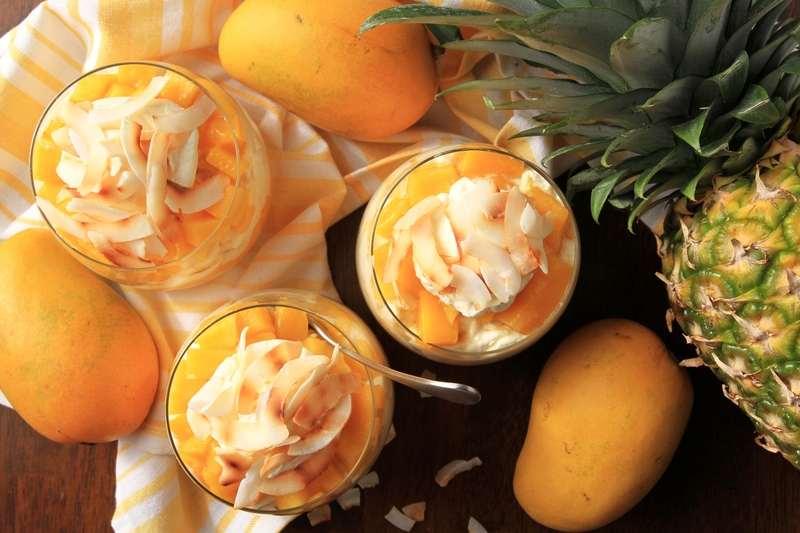 Spoon pineapple cream into glasses, alternating with fresh mango. Top with remaining shredded coconut. If you accidentally over-whip the cream past the soft peak stage and find it clumping up, don’t despair. Pour an extra tablespoon of heavy cream and whisk by hand, adding more cream until it becomes soft and billowy again. If you make too much cream, you can drop spoonfuls onto a parchment-lined baking sheet (or pipe it into swirls) and put it in the freezer. Then once frozen, remove from the pan and store them in a freezer bag for future use (to put in a cup of hot chocolate for example). What is the Pineapple Express? It is a stream of warm air and moisture from the tropical Pacific around Hawaii that fuels strong winter storms that hit the west coasts of the U.S. and Canada and lingers for days or weeks. The earliest record occurred in 1862, when storms lasted for 45 days and created the Great Flood of 1862. 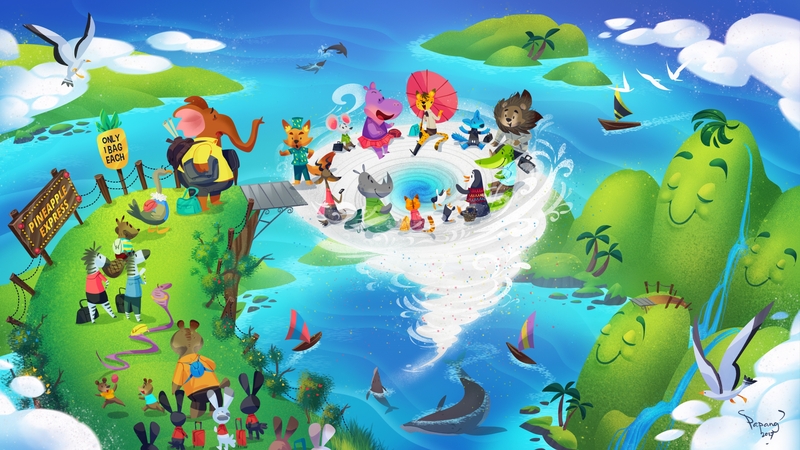 In more recent years, the Pineapple Express brought 11 to 25 inches of rain in certain areas in December of 2010, and fueled storms in December 2014 that created a tornado in Los Angeles. Last January, I wrote this poem during a series of storms from the Pineapple Express. The storms brought much needed rain for California, where we have been suffering through a multi-year drought. Looking at the satellite imagery of the stream of clouds made me wonder what it would be like if we could hop on a storm system to travel around, instead of a plane/train/bus/automobile. How fun would that be?